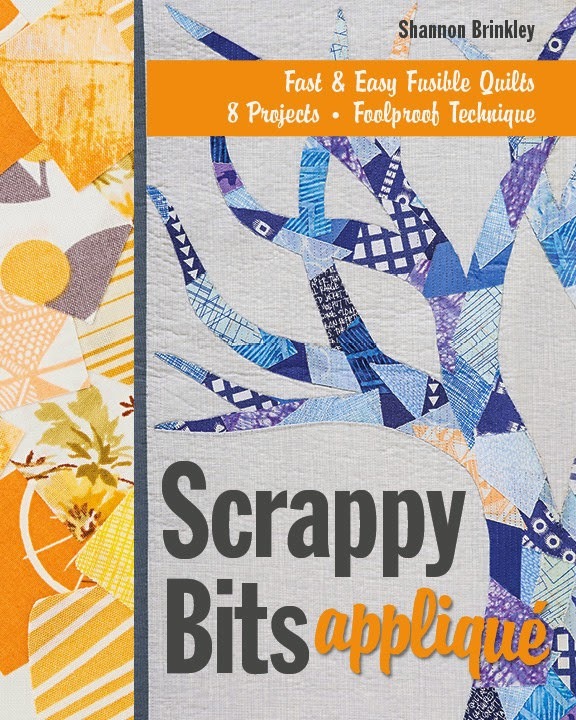 Wednesday, October 8 at 7 p.m.
Shannon will be showing us quilts from her new book, Scrappy Bits Applique. She'll talk about her inspiration and some of the techniques she used to making the quilts in the book followed by a Q&A. Following Shannon's trunk show, we'll also have a panel discussion and Q&A with Rebecca Roach, Heather Grant and another member on how to enter quilt shows, from photography to what judges look for. Get ready to ask all the questions you can think of, the deadline for QuiltCon entry is November 30! 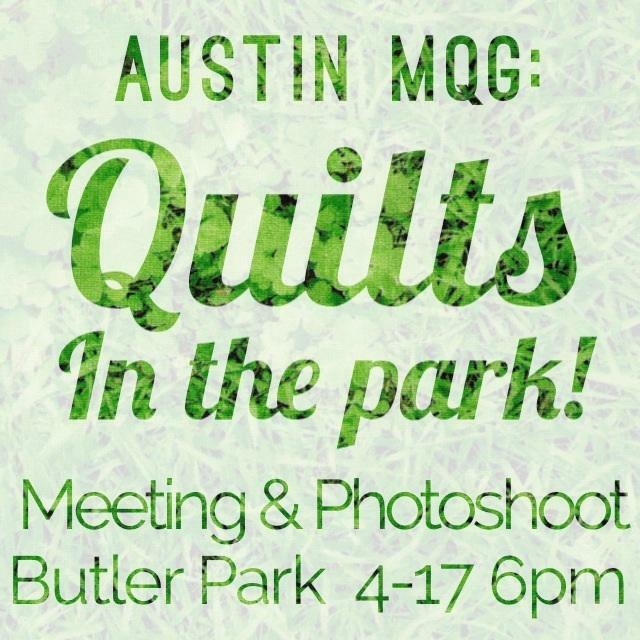 Get to know your fellow guild members and talk about all things Austin MQG after the meeting! See you there! Quilt Festival Houston, aka the biggest most amazing quilt show in the USA! The MQG has a table to chat all about modern quilting. It's super fun. I want to volunteer! Wednesday, September 10 at 7 p.m.
Alternate gridwork is a modern quilting design element that is the basis for many modern quilts. We’ll explore different types of gridwork, drawing inspiration from graphic, web and print design.We’ll also cover basic grid system theory and review its relationship to proportion and ratio. You’ll be inspired with the understanding and ideas to start your own alternate grid design in your next quilt. The Austin MQG will be represented at a small table in the lobby of the Austin Area Quilt Guild Show. This is a great place to meet other quilters and talk about modern quilting! Two-hour slots are available. There’s so much going on right now and we don’t want you to miss a thing. SEW-IN DAY is THIS Saturday, April 26th at the Cotton Cupboard in Lakeway. Join us from 10 to 5. Select the Sew-In Tab and get yourself signed up! 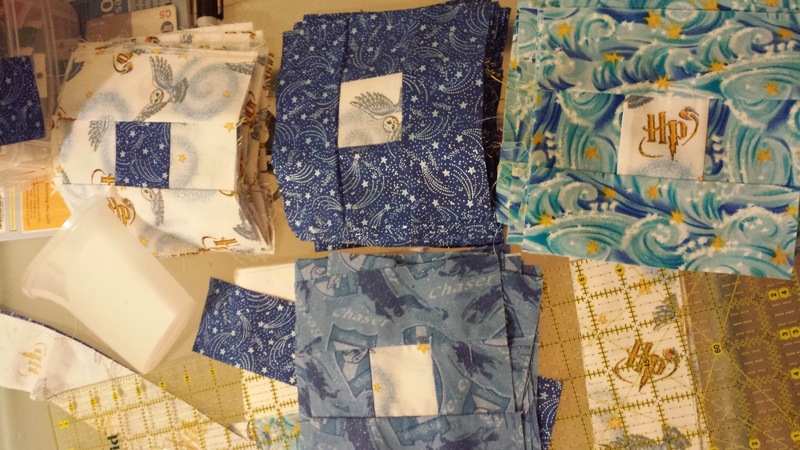 MICHAEL MILLER CHALLENGE: The Modern Quilt Guild is hosting another fabulous fabric challenge. Michael Miller has provided the fabulous fabric from their new Petal Pinwheels collection. Check out the details here! The MQG has extended the challenge deadline to July 25, 2014 so you have plenty of time to create something awesome! - Bunny’s Designs, 1604 Rio Grande, St, ATX (512) 391-6200. Friday (4/25) 11-6 p.m. and Monday (4/28) from 11 to 5. Sign up now for the May retreat at Wimberley Quilt Ranch May 9-11! Join us for a picnic and Quilt Photoshoot at Butler Park! We'll have professional photographer Summer Milliman on hand to take pictures of our finished quilts with the fabulous Austin skyline in the background. This is a social meeting - no formal program is planned. Bring a chair or picnic blanket, something to eat and drink, and your quilts! Family is welcome too! In the event of bad weather, we'll post updates on the Austin MQG website, Facebook page, and Instagram account (@AustinMQG). The next Modern Quilt Guild fabric challenge is here! Fat 8th packs of six fabulous Michael Miller fabrics will be available for pick up at the April and May Guild meetings. You can win a year's worth of fabric from Michael Miller! More details will be on the blog shortly. Join the fun at the next Sew-In: April 26th at Honeybee Quilt Shop from 10 to 4 p.m. Sign ups are coming soon. 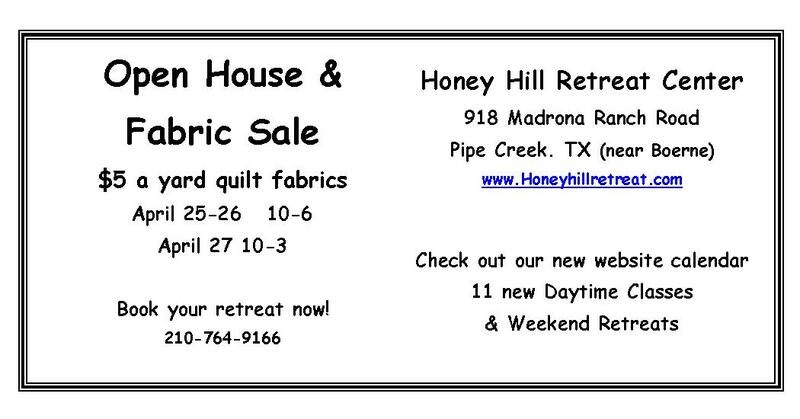 Sign up now for the May retreat at Wimberley Quilt Ranch May 9-11. Check the blog for details! 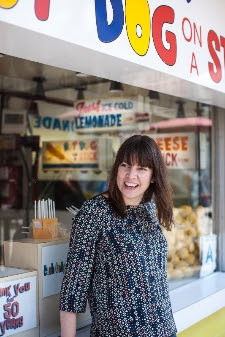 Heather Ross is coming to Austin! She will be at Book People on May 14th reading from her new book. Details to come. Let's start out with a big THANK YOU to Lily Gonzales-Creed, Windham Fabrics and Angela "Bunny" Milliman for making our February meeting so fabulous! Those Japanese quilts were amazing and Lily's sharing her story was very inspirational. Seeing your own name on the selvedge? WOW, what a moment that must have been! Do you IG? For those of you who are on Instagram, The Austin Modern Quilt Guild now has our own IG account - you can follow us on @AustinMQG. If you're not on Instagram, join the fun! I'm sure that there are plenty of your fellow members happy to show you how. Our March Meeting will be held on March 26, 2014 at Sew Much More (3010 W. Anderson Lane, ATX). Sew Much More will be open for shopping before and after the meeting and there's a 10% discount for all meeting attendees! Check-In (and socialize or shop) from 6:30 to 7 p.m. and our meeting will start at 7 and end at 9. At least that's the plan! 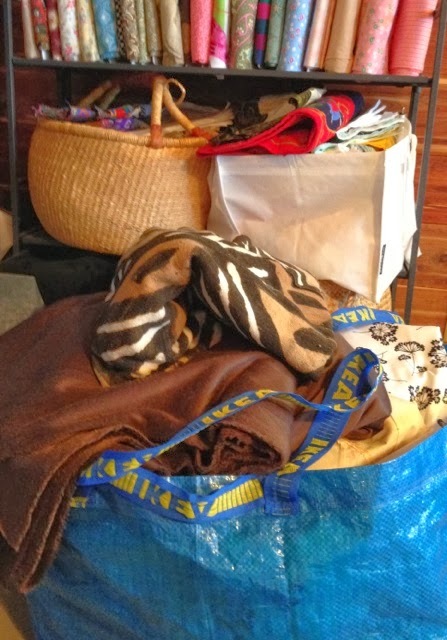 DESTASH - Do you have fabric or notions you want to destash? We'll be having a Spring Cleaning Destash in March. Here's how it will work…gather your stuff to destash, print out this handy-dandy sheet of Claim Tickets. Fill out your portion of the Claim Ticket (one ticket per item), and attach the ticket and place on the DESTASH TABLE at the meeting. We'll have time before and during the meeting for members to check out the offerings. Each item is claimed when the member signs their name on the Claim Ticket. We'll leave time at the end of the meeting for buyers and sellers to connect and arrange for payment. Sellers should indicate what form of payment is acceptable (Cash, Check, PayPal, Swap). MACHINE TLC - Does your machine need a lube job? Do you have tension issues? Size compatability problems between thread and needle? We'll share some tips and tricks for standard machine maintenance and trouble shooting that you can do on your own. All it takes is the courage to open up your machine's owner's manual, a few simple tools and you'll be ready to welcome Spring with the pedal to the medal! A CLEAN SEWING STUDIO IS A HAPPY SEWING STUDIO - We've seen them on Instagram, Facebook, Pinterest, etc…there are some AMAZING ways to store your stash, outfit your space and inspire your creativity. E-mail your favorite links, photos or ideas to Secretary@austinmodernquiltguild.com with a brief description to Angela by the end of the day on March 24th. Angela will compile these great ideas and we'll have a share fest! 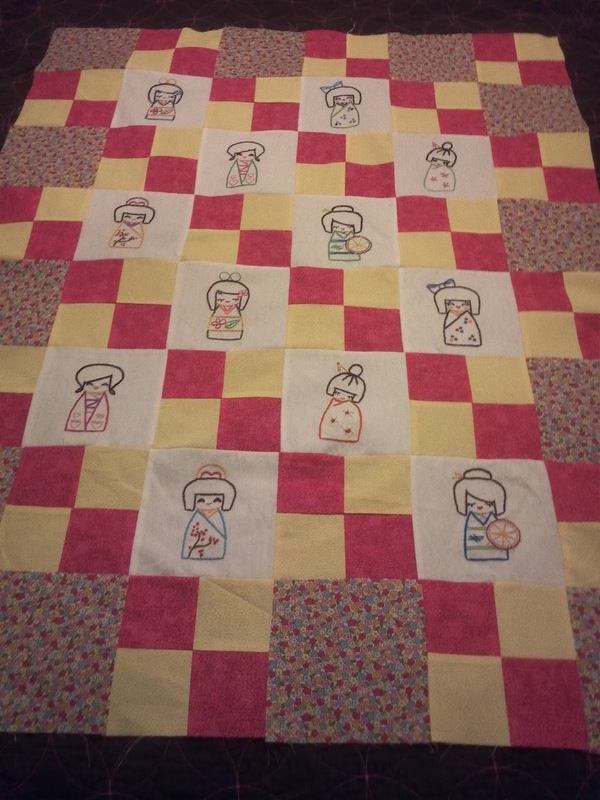 SHOW AND TELL - Show us your Quilts! > Sign up now for the May retreat at Wimberley Quilt Ranch - check the blog for details! > The March Sew-In Sunday at The Stitch Lab was a sold-out event - we had a great time! Join the fun at the next Sew-In: April 26th at Honeybee Quilt Shop from 10 to 4 p.m. Sign ups are coming soon. > Be sure to bring your charity blocks for the give away! I know this one was a tough one - triangles can be scary! 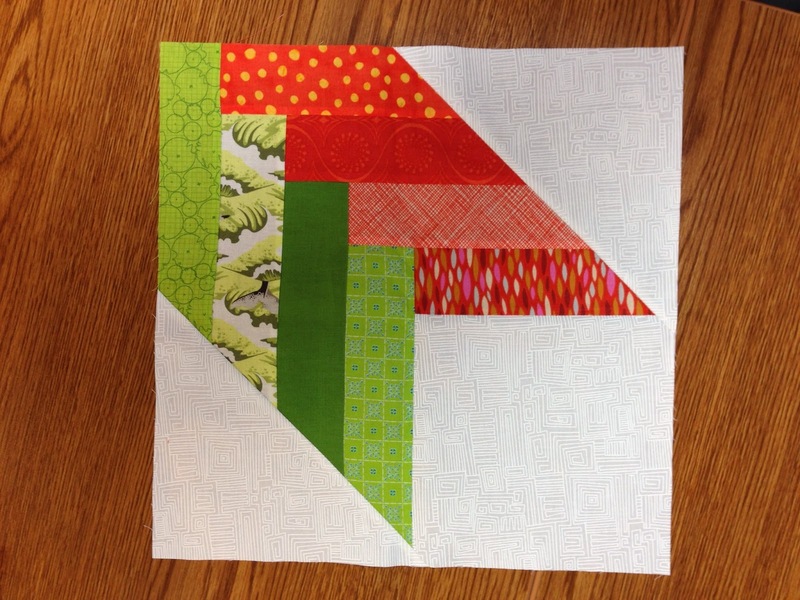 If you didn't have a chance to make the block, you can bring an alternate 12.5" square block you've made, or even just a 12.5" square piece of fabric that is solid or print green, orange, yellow, or neutral. Each block or square you bring will enter you once to win an awesome prize! > APRIL 10th MEETING - Fabric, Food and Fresh Air! We'll be planning a photo shoot and picnic for our April meeting. Details to come! Are you itching to attend a quilt show? 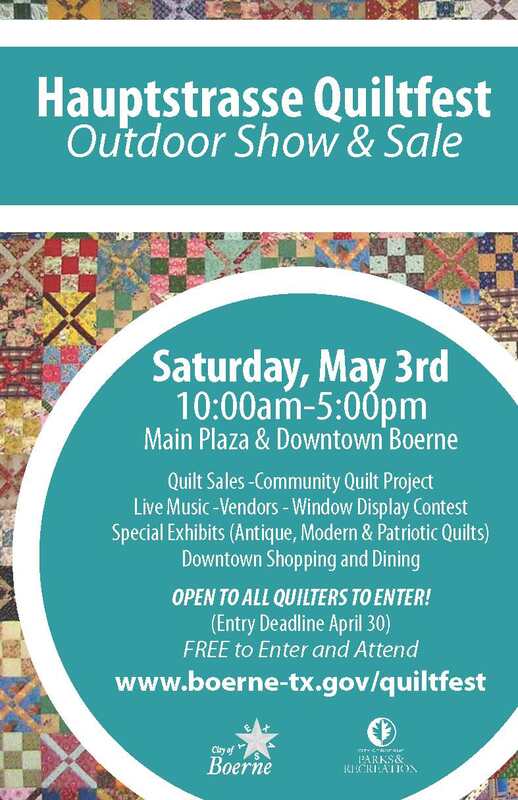 Go check out the Boerne Hauptstrasse Quiltfest on Saturday, May 3! You may have met Cathy at a meeting or seen her often hilarious posts on the Facebook page. She's a gem, and she's going to share a bit about herself and her WIPs this week! Hello, my name is Cathy Ledbetter and I think I may hold the title of the most remote active member of the guild. I live in San Saba County on a historic family ranch with my husband, Macy, my son, Wade, and lots and lots of animals. My daughter, Shelby, lives in Austin and is also a member of AMQG. I have been making things as far back as I can remember. When I was four or five, my dad brought me a child-sized, chain-stitching sewing machine from Japan. I sewed every bit of fabric I could get my hands on until several months later, when our house burned down with the sewing machine inside. My mom let me sew on her machine starting when I was eight or nine. By thirteen, I was starting to make a lot of clothes and made most of my own clothes through high school and college. I earned a BS in Home Economics Education from the University of Tennessee and an MS in the same field from Texas Tech University, so I sort of made “making” into a profession. I’ve always loved quilts, but didn’t try to make them because I thought it all had to be done by hand. And I have a perfectionism problem I am trying to overcome. Ten years ago I attended the Houston festival, bought a Roxanne thimble, and started quilting. I didn’t produce many finished quilts until I decided to learn how to free-motion quilt. I am still learning, by the way, practicing a lot and still working on that perfectionism thing. Lately I have been working on the projects I started at the Portland SewDown, and I have been working on those highly addictive Sew Along bags (pattern by Sew Demented). I have have quite a long list of WIPs on my pledge card, most of which need to be quilted. Emily provided me with some charity quilt projects so that I can be sure to get LOTS of FMQ practice in the coming weeks. Being around AMQG members is like Red Bull for my creativity--Thanks Y’all!!! That big blue bag holds all the WIPs on my pledge card. There are more WIP-ish things on the shelf. 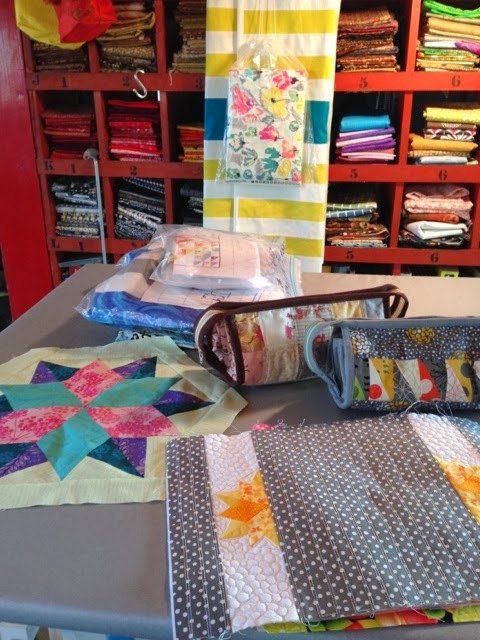 But this is what I have been doing instead: Charity quilts, Sew Together bags, the You+Me quilt with it's backing all ready to go, and the Sidekick Sampler star waiting to be quilted into a table topper. Great stuff Cathy! Remember everyone, the monthly meeting has been rescheduled to Wednesday, March 26 at Sew Much More. Now, what have you been busy sewing? Link up! 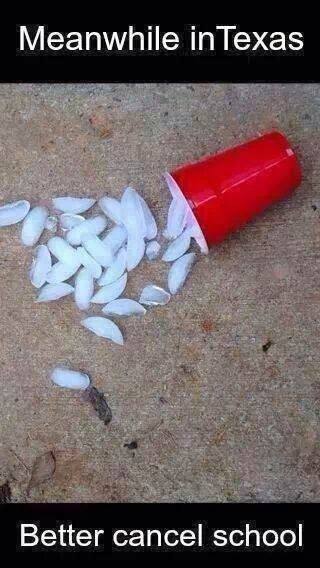 I was lucky enough to have an ice day yesterday and didn't have to go work until noon. 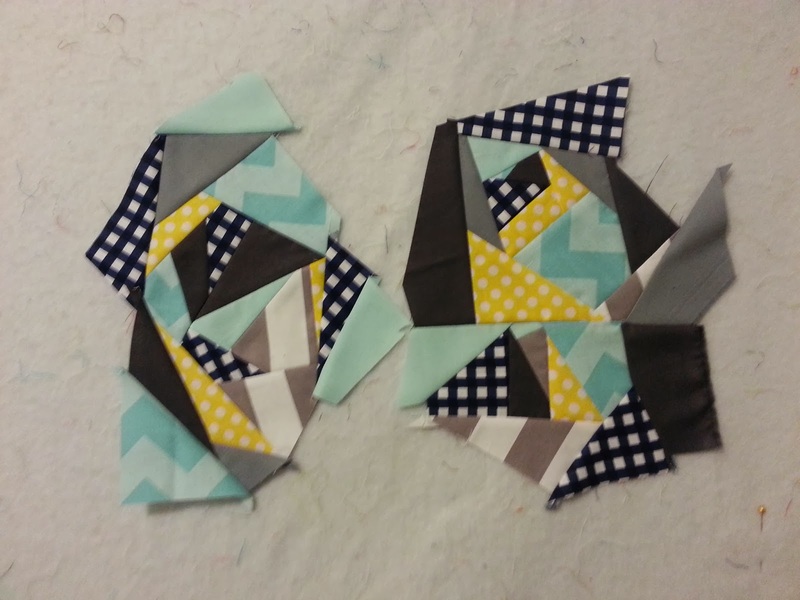 That gave me some time to work on the binding of my Riley Blake challenge quilt. You will hopefully crack up laughing when you see it at the big reveal! Speaking of the Riley Blake challenge reveal, have your project finished by the Austin MQG meeting Thursday, February 13 at Book People. Bring it to the meeting and we'll have a table set up where you can proudly display it for a popular vote. The MQG deadline isn't until February 17, but you'll be finished already and just have to post your photo to the MQG feed for the national competition. Be sure to follow all the rules to make sure your project is eligible for the national contest! Anywho, show us what you've been creating lately! Wow, what a response to our BOM Challenge! So far we've had 141 blocks donated by our lovely AMQG members. Remember the first challenge block from August? Jessica D brought the finished quilt to the meeting last week and it's just beautiful! 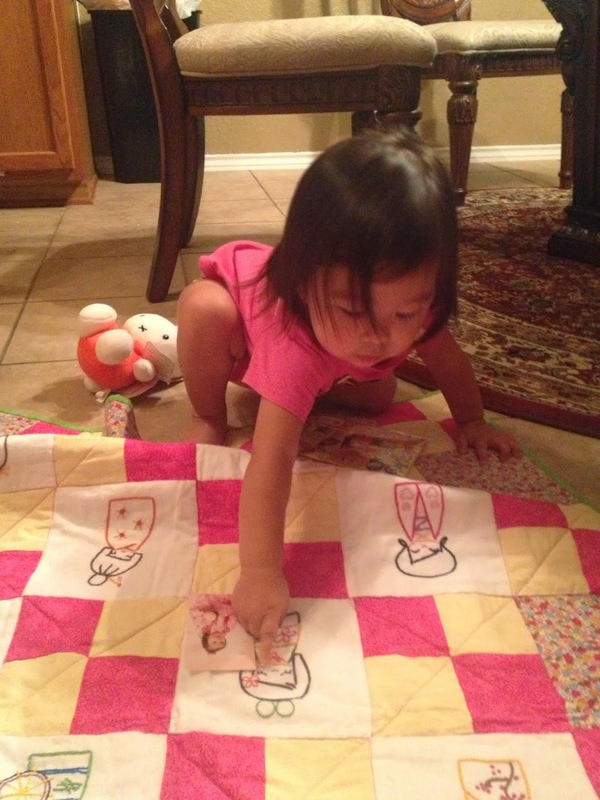 The quilt will be donated to Friends of Annie. If you'd like to help put together quilt tops from September and November blocks, please let me know! 1. Susan M with 41 blocks! This block was chosen by Jessica, a fabulous member of the Charity Committee. Please use a white or silver background with blues or turquoises that contrast. Won't this make a gorgeous winter quilt? I can't wait to see what you make! The deadline for the MQG Riley Blake Challenge is looming oh so close (Feb 17) and inspiration finally hit me last night! What about you? Have you started on your challenge project? Rules and guidelines can be found on the Riley Blake Challenge tab. Be sure to tag your photos #mqgrileyblakechallenge and #austinmqg on Instagram and Twitter! I'm starting with some crazy piecing. I added a little Kona grey and aqua to the mix and decided to leave out the orange. I sketched my idea and showed it to my boyfriend, who was sick in bed with cedar fever, and he nearly fell out of bed laughing, so I think the idea is a good one! Now I just have to make it work, people! You can view the proposed changes to the Austin Modern Quilt Guild By-Laws and Policies and Procedures (formerly Rules and Regulations). Please review as we will be voting on these changes in the future! Meeting Agenda: Whip your WIPs into Shape! We will start the meeting promptly at 6:30 pm. Please check-in at the membership table before finding a seat. We'll welcome any new visitors that are in attendance. c. Events - Corinne will give us the scoop on The MQG Riley Blake challenge due in February 17 and also announce Sew In dates. President Mary Anne will present proposed revisions to our current by-laws and we will vote on these. Whip your WIPs into Shape this year with us! Bring a WIP or two to the meeting with you. We'll spend some time talking about how to manage your WIPs. 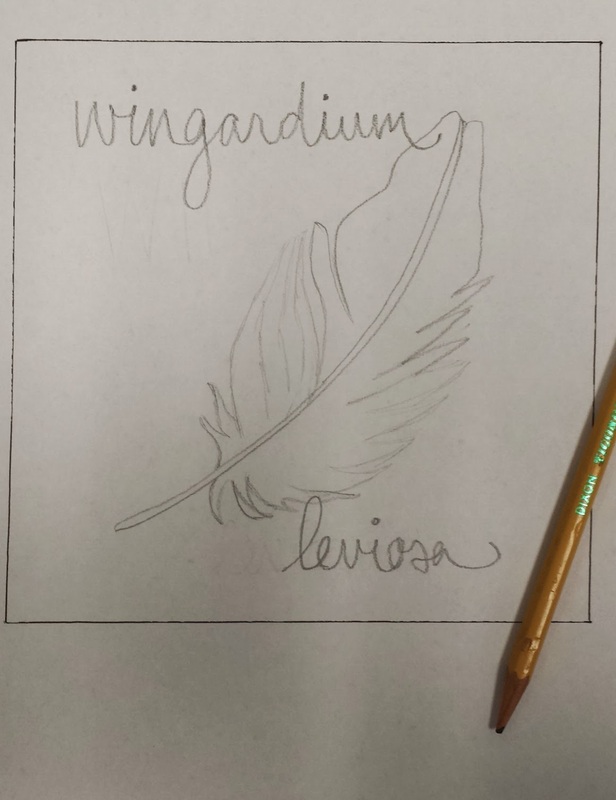 We're going to have a WIP Challenge! We'll break into demo stations and discuss the challenge process, have a demo on spray basting, and also a demo on making string blocks. Take a few minutes to chat with other members and new visitors. 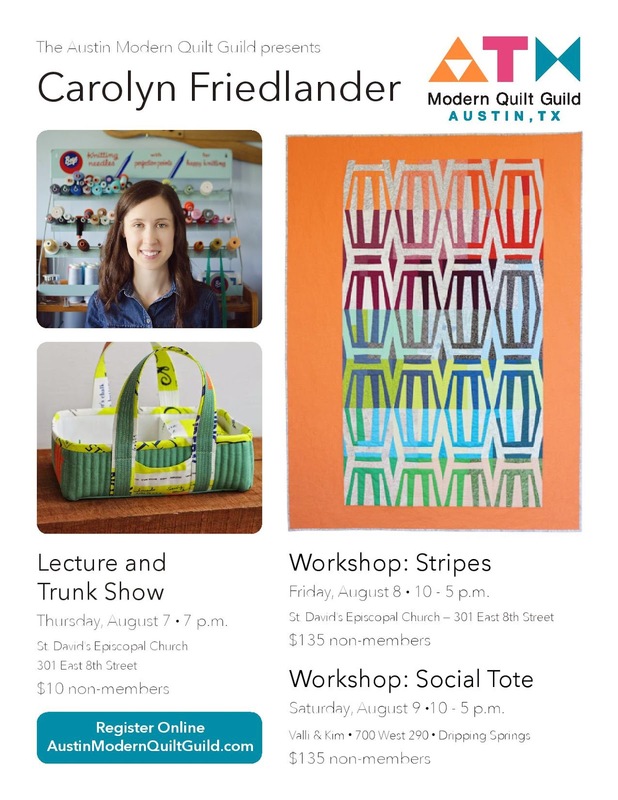 Please join us and enjoy a night of modern quilting! See you Thursday!